IT Band Syndrome "Runner's Knee"
Pain from the sole of the foot "Plantar Fasciitis"
The Type A Ultra Roller is designed for all body types. The roller provides relief to tense, tired and sore muscles by rolling the massage "gears" across the legs, arms, back and other affected muscle groups. The Junior Roller is a lightweight versatile roller that works great for plantar fasciitis and getting into hard to reach muscles. 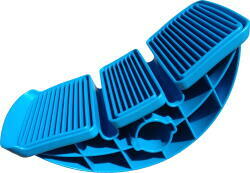 Designed to be held one handed or placed on the floor for plantar relief. This easily portable roller also works great for the athletes on the go. The Type C has all the features of the Type A but with added Surface Skin Technology (SST) that gives a softer and more tactile feel to the massage. Place the Type D + on the floor and it becomes the perfect foot massage tool or amped up foam roller. Hold the Type D + with both hands and it becomes a powerful massage tool for the back, shoulder and legs. Step on and lean forward! A calf stretch that hits the spot. Type S has a wide footstep that can accommodate multiple body types.